Bugzero and ActiveLog user base is growing quickly and steadily. Bugzero has a proven track record. It is simply easier and more flexible and configurable. 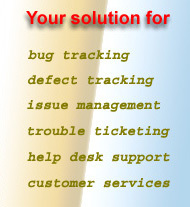 Businesses and organizations around the world, including Fortune 100 companies, government agencies, educational institutions, and start-ups, are using Bugzero for their software bug tracking and customer helpdesk support. Isn't it time you try out Bugzero too? JPL of NASA, Aerospace and etc.